When I posted on roses last year, Gypsy of Once Upon a Blog reminded me that roses are also very significant in the history of "Snow White", and referred me to Kate Forsyth's fabulous post on Snow White. 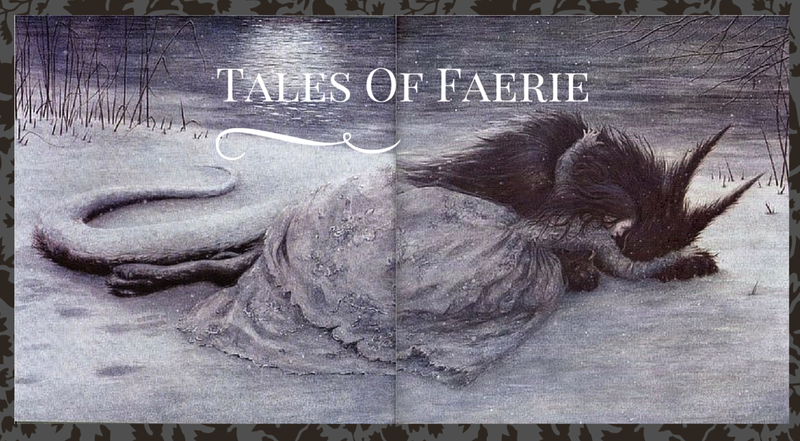 There's a 9th century Norse saga that includes the tale of "Snow Beauty." A king's beautiful wife died, but her cheeks remained rosy. He became obsessed with the idea that she would come back to life, and neglected his kingly duties, sitting by her side. When his councillor finally suggested he allow them to change the bedclothes, they lifted the body up, "a rank smell of rotting rose with her, the body turned blue, and worms and adders and frogs and toads crawled out. So she was burned, and the King returned to his wits." In Basile's "The Young Slave" (published 1634), arguably the oldest literary version of Snow White, the mother became pregnant with Snow White after swallowing a rose petal. 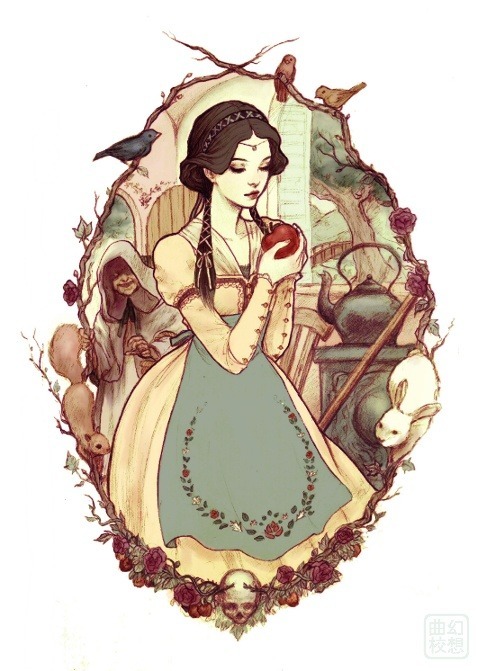 In the first version of "Snow White" that the Grimms collected (in 1808), there is no hunstman, but the Queen sends the girl into the forest to collect roses and abandons her there. (This is in the Grimms' earlier manuscripts, but by the first edition of tales in 1812 the story had become the version we have now with the huntsman). I wonder why we've lost all associations with roses and Snow White in our current versions? I found it hard to find any images of Snow White with roses for this post, despite the general association of Princesses with pretty flowers. The stark color contrasts of red and white featured in "Snow White" do recall common rose shades to mind, such as in the fairy tale "Snow White and Rose Red." In that tale, the different shades represent the two sisters and their contrasting personalities. Another interesting tale for comparison is "The Snow, the Crow, and the Blood." Though it is more similar to Twelve Dancing Princesses than Snow White, it starts off with the motif of a Prince who sees the color combination of white, black, and red and decides he must have a bride of that coloring. Later in that tale, the enchanted princess shows the hero a rosebush-there were three hundred and sixty five rose bushes; all of them had a victim's head as the flower except one, and the Princess told Jack she hoped to have his head on the last rosebush. 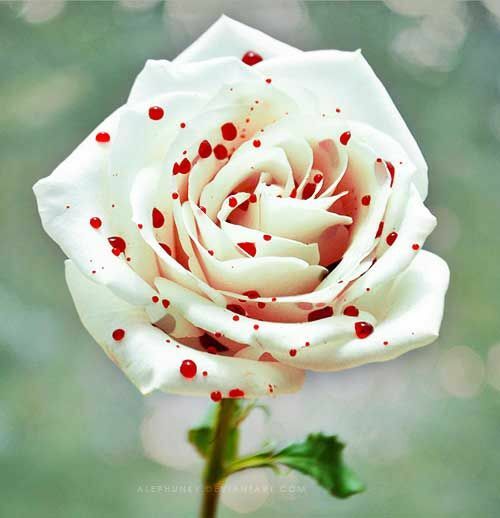 It seems that roses, despite being the cliche and overly romantic flower we think of now, often had a history of being very morbid in fairy tales, especially those related to Snow White. It's because of fairytales that my favorite coloring is also black, white, and red. I haven't read Snow White and Rose Red in a long time, so how exactly did their personalities differ?